Set of two beautiful bracelets from Alex and Ani. 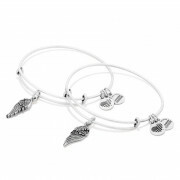 These stunning bracelets are finished with a silver tone and each have a detailed wing charm. These wings bracelets look fantastic as stacked bracelets.